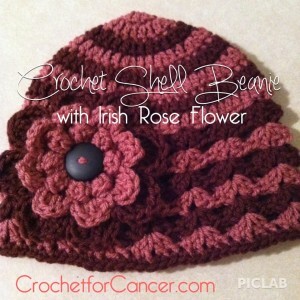 Crochet Shell Beanie with Irish Rose Flower - Crochet for Cancer, Inc. I made this striped Crochet Shell Beanie with Irish Rose Flower using Hobby Lobby’s I Love This Yarn. The beanie pattern is by Crochet Hooks You and the Irish Rose is by the Crochet Geek. Patterns below. For more chemo cap patterns please click here.